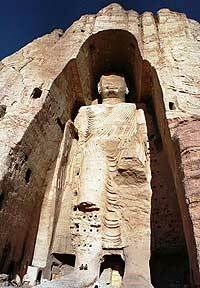 Bamiyan, Afghanistan -- A part of a Buddhism sutra was found inside one of the two giant Buddhas of Bamiyan, providing a hint for unveiling the mystery surrounding the creation of the statues, a Japanese news agency reported Sunday. The fragment of the scripture was believed to be the original Sanscrit document, written with the letters often used in the 6th and 7th century, according to a Kyodo news dispatch from Kabul. A German team of researchers from the International Council on Monuments and Sites found the sutra in July inside the rubble of the remains of the Buddhas, said the report, printed in major Japanese newspapers. The researchers believed it was placed inside the eastern side of what used to be the world's tallest standing Buddha statues. They were destroyed in 2001 by Taliban Islamic extremists. Although various scripts have been found inside Buddha statues in Japan, it was the first time a sutra was found inside an Afghan Buddha statue, Kyodo said. The script was written in "Gilgit/Bamiyan type one characters," which were used in a region that spread over what is now northern India, Pakistan, and Afghanistan, Kyodo said. The document was the beginning section of a sutra that spelled out the basic belief of Buddhism and said all things were mortal, Kyodo said. It was written on pieces of birch bark and wrapped in a piece of cloth with mud balls, which could have been symbols of Buddha bones, according to the researching team, Kyodo reported. The team also found a small metal plate, decorated with a flower-like pattern. They also found a clay seal with a snake and a bird-like creature, Kyodo said. Experts believed the decorations and signs might symbolize a specific group, which might have been a sponsor for the construction of the giant Buddhas, Kyodo reported. The sutra was being kept at an Afghan facility in Bamiyan, Kyodo said.